Seahorses are so instantly recognisable that they almost need no introduction. Creatures of myth and storybook, it comes as a surprise to many people that they are in fact fish, complete with gills and fins. Unlike most fish, however, they have a tube-like snout, bony external armour instead of scales, and a grasping tail to hold onto seagrass, corals or other holdfasts. They are also unusual because it is the male that broods the young, and most species studied to date form strong pair-bonds that are maintained by daily greetings. Highly sought after for traditional Chinese and other Asian medicines, as well as for curiosities or aquarium fish, it appears that the trade is not sustainable. 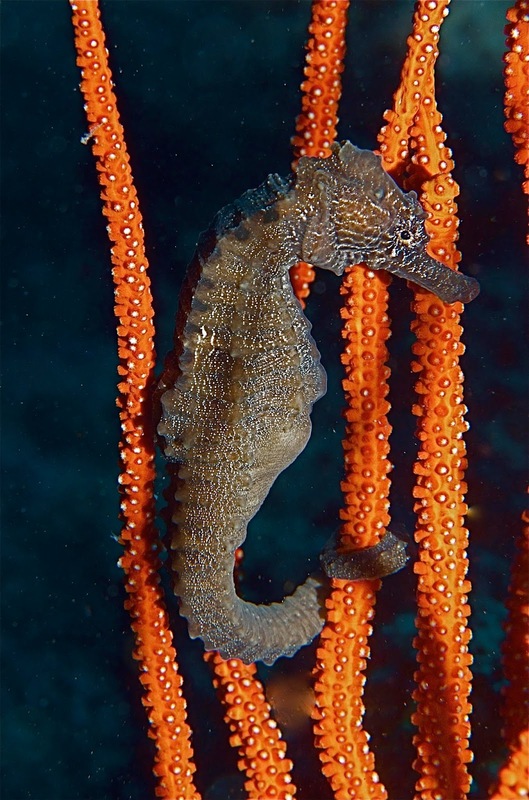 Seahorses are caught accidentally in trawl nets by the millions, and given the fact that they tend to live at low densities and have complex social structure, this is decimating their populations. As a result of these threats, they are the focus of much conservation concern. 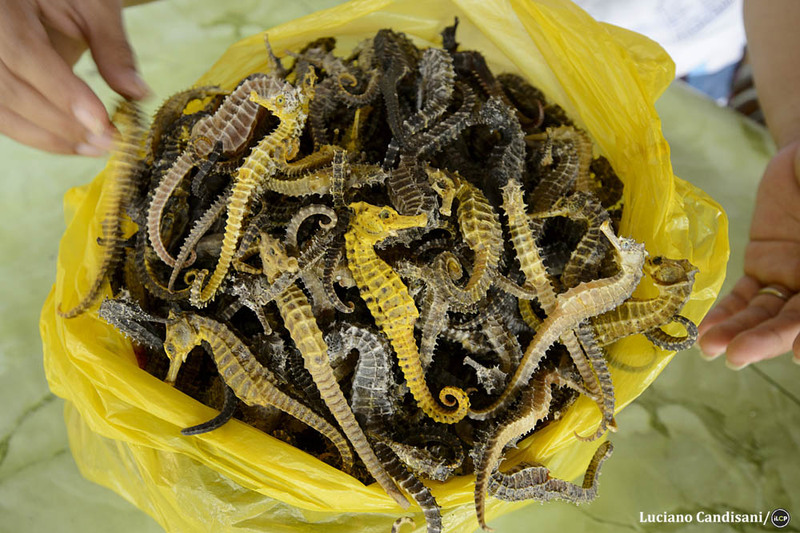 The seahorse trade appears not to be sustainable. The oldest seahorse fossils were found in 12.5 million-year-old silt-stone deposits in Slovenia, but genetic data suggest that seahorses evolved from pipefish-like ancestors approximately 28 million years ago. Today they are found in shallow tropical, subtropical and many temperate seas throughout the world. 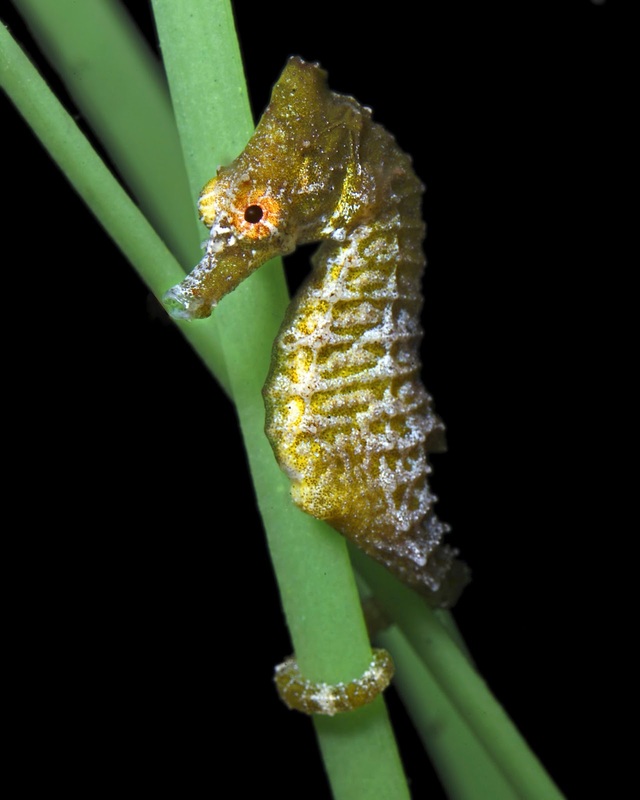 A few are found in estuaries, but there are no truly freshwater seahorses. There are approximately forty species in the genus Hippocampus (meaning ‘horse sea-monster’) living in a variety of habitats, including coral reefs, seagrass beds, mangroves and soft-bottom areas. 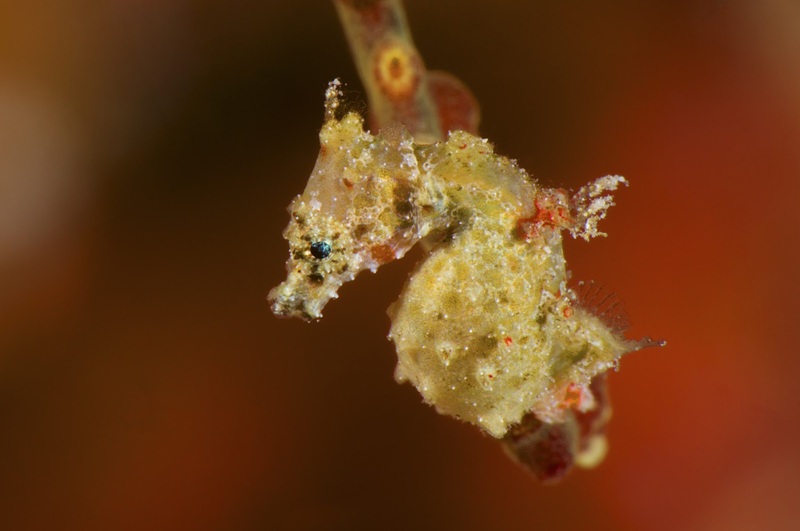 They range in size from the pygmy seahorses (such as Hippocampus satomiae, ~ 1 cm in height) to the giant Pacific seahorse (H. ingens, > 30 cm in height). Satomi’s pygmy seahorse (hippocampus satomiae). They are relatively conservative in their body form, although they vary in terms of their body ornamentation, spines, coronet shape and size, fin rays and body and tail rings. As ambush predators, they rely on stealth and camouflage to avoid detection by their prey, aided by their ability to change colour to match their surroundings. They eat small crustaceans (such as tiny shrimp, or crab larvae), which they efficiently vacuum up with their snout using some of the most rapid suction action known in the animal kingdom. Drawing on much of the latest research, Seahorses is an in depth, but accessible introduction to these fascinating creatures. It provides background details about their ecology, behaviour and evolution, as well as their connection with humans in terms of culture, trade, and conservation action. The second half of the book provides a species by species account of all the seahorses, as well as a selection of their relatives within the family Syngnathidae, including a number of pipefishes, pipehorses, and seadragons. The book hopes to inspire and educate readers, as well as to raise awareness of the fragility of the marine realm. 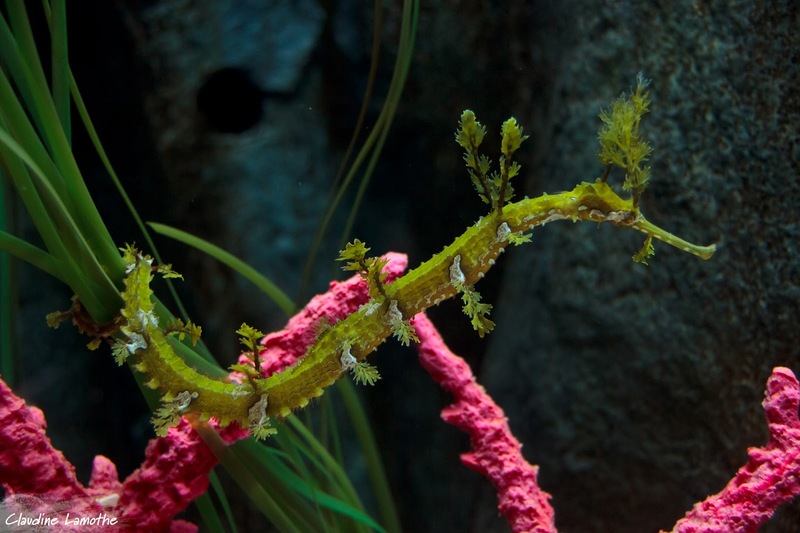 Can the charisma of theses unusual creatures help motivate conservation action for seahorses and their imperiled marine habitats? Sara Lourie has been involved with Project Seahorse, an international marine conservation organisation, since it was founded by Amanda Vincent and Heather Koldewey in 1996. She published the first seahorse identification guide in 1999, described several new species of pygmy seahorses, and received her PhD from McGill University in 2004, with a thesis on the genetic connections among populations of seahorses in Southeast Asia. She has travelled extensively and continues to work on marine conservation projects, particularly in Indonesia. 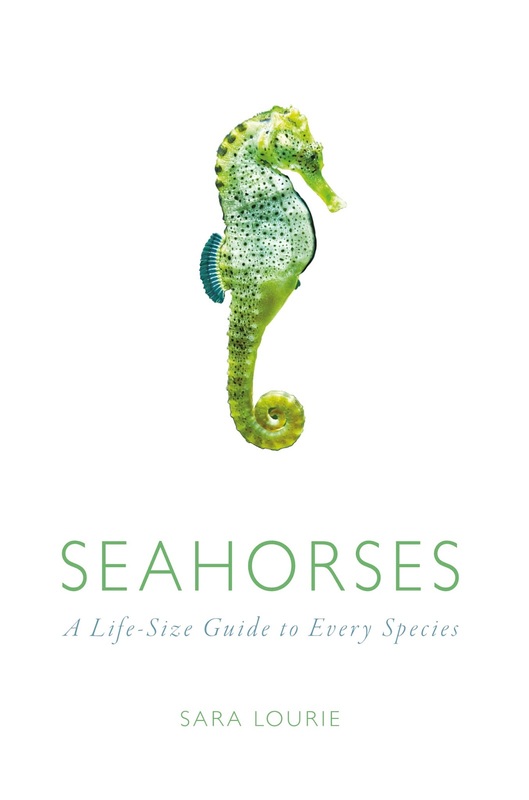 Seahorses: A Lifesize Guide to Every Species by Sara Lourie is published by Ivy Press.